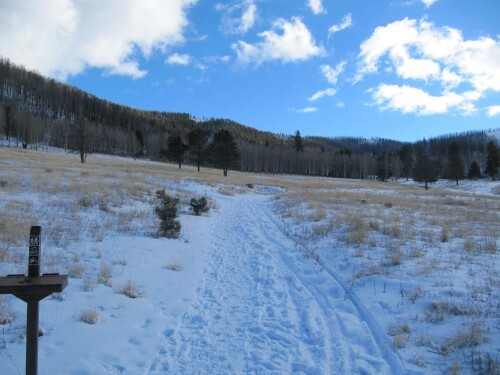 On Christmas, Frances, daughter Mag, and I set out from the Alamo Boundary Trailhead on a ribbon-thin track of snow amidst abundant flora on an out-and-back toward the south leg of Coyote Call (Sam Beard's "Most Beautiful Mile"[SMBM]). The preceding Monday, there were high winds here in Los Alamos, so it was not surprising that a number of trees had blown across the trail. None were impassible, and we were able to move a few off of the trail. At the saddle (SE corner of Coyote Call), we observed some obstacles further down the east side near the top, but continued west. There were a few step-over and duck-under obstacles, but we were able to ski for about 10minutes before coming to a pair of trees that were a little to high (for 6'2" me) to easily get over, but a little to low (for 5'3" Frances) to get under. The snow on SMBM was 3-5" deep and had been packed by a skier. There were no skritchy surprises under our skis. Alamo Boundary was thin, but since it's a popular hiking trail it, too, was devoid of rocks and roots, except for several bare sections that we gently picked our ways across. On Saturday, I set out with my hand saw to see if I could improve the CC situation. I'll send a more detailed report to Sam, sawyers, and swampers. In brief, I was able to clear a passable path for most of the way around (with one easy step-over, and one pretty high duck-under), but there were two trees that were well above my pay grade. Fortunately, or, for better or worse, they are close to each other and to the severely eroded section near the west end of SMBM, so getting over all three obstacles should only require a single hike. Attached is a track that shows their location. The map shows the Alamo Boundary trailhead and its relation to NM4, FR289, and the Upper Frijoles Loops. The major obstacles are located at the Waypoint labelled "39." Other numbered waypoints can be ignored. Also attached is the view from the trailhead, which looks worse than it was. The snow had been hiker- and snowshoer-packed all the way around, but it was easy to get into some powder on the side of the trail coming down the meadow. SNOTEL has not been encouraging, but I'll try to get another Jemez excursion in soon. We've had plenty of snow in the driveway.